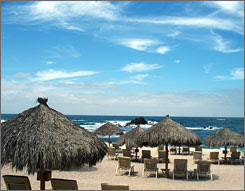 Did you know that the laid-back, authentically charming town of Punta Mita has a Four Seasons? This was the hotel to start the luxury boom along the 100-mile coast north of Puerto Vallarta known as the Rivieria Nayarit. I had no idea either, and the fact is they do a very good job of making it fit right into the relaxed atmosphere. So, for casual luxury with a side of sophistication, this could be your place to visit Riviera Nayarit for the first time.